Tilda Pure Basmati tastes like no other rice on earth - tantalizing flavour and a magical aroma. Brown Pure Basmati is the classic grain with all the natural goodness and flavour of the bran untouched. Basmati is a unique rice that grows only in the foothills of the Himalayas where it is watered by snowfed rivers and hand tended by dedicated farmers. 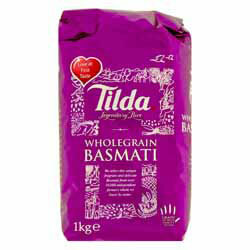 Tilda select only pure traditional Basmati to guarantee delicious fluffy rice.